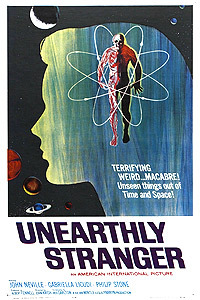 Unearthly Stranger (1963) - Sci-fi-central.com. UK  1963  78m   Directed by: John Krish.  Starring: John Neville, Philip Stone, Gabriella Licudi, Patrick Newell, Jean Marsh, Warren Mitchell.  Music by: Edward Williams. A series of scientists working on a new techology to facilitate man's conquest of space are killed in mysterious circumstances. Suspicion falls on the wife of another scientist on the project, who may not be what she seems. Thank goodness they did not make this film in color. Certainly color would have made this film at the time less the masterpiece that the film is. Also color might have made us concentrate not on this first rate story and acting, but also the bare budget that this film most likely had. While many have compared the film to Invasion of the Body Snatchers and I Married an Alien From Outer Space, I think that it has more in common with another film that was made the same year of 1963, The American production of The Day Mars Invaded Earth. Both films concern an alien entity basically fighting back in insidious ways to prevent scientists from the planet earth into invading their planet, and seem to infiltrate the Earth much the same way in both films. What is intriguing about the film as I have written in my Summary title is its feminist angle. Years before women were demanding equal pay for equal work, this film presents a world where women are actually valued more as not being equal to men, but also as somewhat of a prized possession. After our introduction of the main character, it is interesting to note that when we go back into flashback, we see men in suits scouring around doing their important work, while two women on a staircase are cleaning and scrubbing on the floors of this building, doing what can be described as menial work. The next is when we see the first victim meeting with his secretary played by Jean Marsh before her Upstairs Downstairs triumph. She appears to be the dutiful secretary of a smart man. Subordinate to his needs When we meet Patrick Newell who would later go on to fame playing Mother in The Avengers, an obnoxious investigator, he is making rather stupid comments about John Neville (the main character of the films) wife. Later on when we meet the wife she is playing the dutiful wife of our main protagonist, a stay at home woman of the time. Yet in many ways the men, accept for Phillip Stone, are not shown to be so smart. Certainly the first victim of the film is careless in revealing what he has discovered. John Neville's character should have thought more clearly about getting married to someone who he has just met, also considering about the vital work and top secret work he is doing. He also shows rather immature behavior to his colleague played by Stone, when he does not apologize for his rude behavior when suggested that he should have done so. Patrick Newell seems very content to eat sweets while investigating, no doubt contributing to his considerable girth, plus appearing to be less than likable. Stones character will turn out to be the savior of the film in some ways, as he rescues Neville;s character from certain death. While Neville is intelligent, it is Stone who is portrayed really as perhaps one of few who can save mankind, with his rational thinking. Gabriella Lucidi the wife, who made very few film appearances is effective in her brief time on screen as the alien form who has succumbed to be a female human being, and who later will be denounced as having been weak and not like the other stronger beings that are among the humans on earth. As a woman, Gabriella Lucidi's character it is suggested may really be the woman of the past. Not content really to be subservient to a man's needs. The children probably fear her because they realize that with women like her, they would probably not have been born, and are more aware of the threat that her kind is. Until his death in the film, we are somewhat led to believe that Patrick Newell's character is the real villain, the surprise of course is that it is Jean Marsh, who by declaring that not all of her life forms are like Neville's supposed wife, is suggesting really the coming of a new woman, one who may not wish to be subordinate to men. Review by kuciak from the Internet Movie Database.